I’ve just added the testimony of Zinaida Pytkina to the site – do listen to it if you can. Because she was one of the most extraordinary human beings I ever met – she was certainly the most terrifying woman, and bear in mind she was in her 70s when I encountered her in Volgograd about ten years ago. This photo of her as a wartime SMERSH officer is remarkable, I think, because of her eyes. And she looked at me with exactly that same expression when I met her forty five years after the end of the war. She was one tough lady. Tough enough, for sure, to have no problems about executing a German officer at close quarters and in cold blood – as she told me she did in 1943. But, more than that, she confirmed that she would have been prepared to do pretty much anything to the Germans to get them to give up the fight against the Soviet Union. When she was asked to describe her mission during the war she replied: ‘My mission was to fulfil all the orders of my commanders’. And the implication was clear – whatever bloody deed her commanders asked of her – she’d have responded with alacrity. And I was reminded of this hard, cyncial and uncompromising attitude on that same trip to Russia when I met a member of the FSB in Moscow. (The FSB, of course, is the successor to the KGB which was previously the wartime NKVD which had close links to SMERSH). This man – let’s call him Yuri – was a serving agent with the FSB. He was in his late twenties and immensely tough. 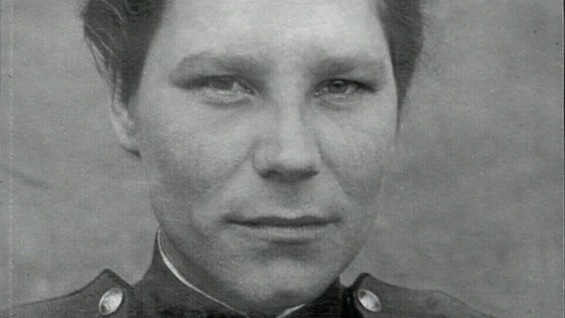 Moreover he also had exactly the same look in his eyes as Ms Pytkina has in that photograph – maybe the Soviet secret police teach it in training. ‘Useful chap to have around,’ I murmured before proceeding to business. But then, six years after this encounter, in 2006, I saw that Alexander Litvinenko – the former FSB agent who was later murdered in London – revealed that he had worked in the ‘problem solving’ department of the FSB. And ‘problem solving’ meant committing murders. Yuri and Zinaida Pytkina. Two peas from the same pod. Thank you for pointing out this interview. I only regret we do not get to hear Zinaida’s voice. Even though I do not understand Russian, her voice would have been very revealing. If you have the original recording it would be very well worth putting it online. I too would like to hear her voice and see her as an old lady! Would her eyes still reveal the horrors in which she had participated so long ago? Another disgusting person – and a woman! Whatever happened to female compassion? Was this woman ever a mother?